The Ducks broadcast all 140 games on the Long Island Ducks Broadcast Network. 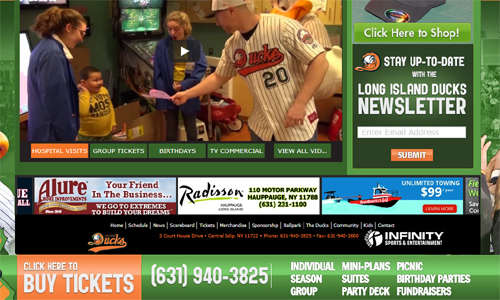 Live streaming HD video and audio is included for each game via BoxCast and can be seen at LIDucks.com and the team's official Facebook page and YouTube channel. The broadcast team consists of Ducks Director of Media Relations & Broadcasting Michael Polak, New York Islanders radio play-by-play broadcaster Chris King, and ubiquitous Long Island radio and TV personality David Weiss. A Ducks media package is the perfect avenue to send your message to listeners around the globe. Single Package: Minimum one (1) spot per game (140 total) on every broadcast. Double Package: Minimum two (2) spots per game (280 total) on every broadcast. Triple Package: Minimum three (3) spots per game (420 total) on every broadcast. Additional specialty packages are available, including Pre- and Post-Game sponsorships, Player of the Game, Out of Town Scoreboard, Community Based Sponsorships and more. Advertising on LIDucks.com is a great way to target your message to Ducks fans worldwide. Combine the popularity of the Ducks with the ever growing use of the Internet and your business can only win! Web site advertising offers exposure to Ducks fans year-round, allowing your marketing dollars to work 12 months a year. The official team Web site is loaded with all of the latest team news and information updated daily. Fans log-on to check scores, player statistics, league standings and upcoming promotions, as well as to purchase tickets and merchandise. Put your ad on the rotating homepage banner or one of many page banners. 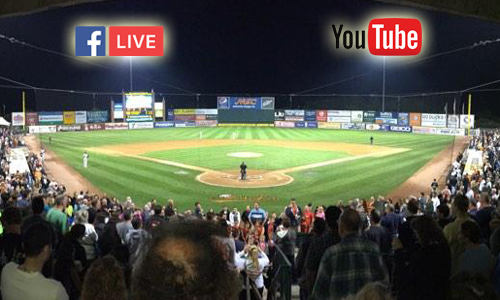 Stay tuned to see if Ducks baseball and your business will be entering the homes of fans across Long Island. If televised, Ducks games will offer TV packages to fit every budget. Add additional value by aligning your logo with a situational sponsorship such as Pitching Changes, Trivia Questions, or Starting Line-Ups. Home Run Package: Includes forty (40) thirty second commercials (3-4 per game), 2 season tickets, 144 Duck Vision advertisements (2 per game) and your corporate logo on the TV Sponsors Page in the Commemorative Yearbook. Grand Slam Package: Includes eighty (80) thirty second commercials (6-8 per game), 4 season tickets, 288 Duck Vision advertisements (4 per game) and your corporate logo on the TV Sponsors Page in the Commemorative Yearbook.